The British Beatles Fan club is dedicated to helping our fans discover new books, music and films about the Beatles. Each issue of our magazine is chock full of reviews of all the new releases with information about how to find those items for purchase. Today we are launching a new BBFC Beatles Shop where you can easily find load of Beatles related books, DVDs, CDs, vinyl records, and just about anything else related to the Beatles. The home page of the shop highlights those items reviewed in the most recent issue of our magazine making it easy to do one-stop shopping. As a bonus, because Amazon host the shop, the BBFC earns a referral royalty with every purchase from the shop helping us to keep membership rates in check. It is a win-win solution. All BBFC items including back issues of magazines are still available on our website directly as well. Did you know that when you visit Liverpool it is possible to stay in the house that Brian Epstein lived in? Since 2003, the house Brian lived in with his parents on Anfield Road has been a guest house open to the public and now, our fan club members have another membership perk - 10% discount on accommodation at Epstein House! It isn't just the history of the house that makes it a special place to stay. There are reminders on display throughout of The Beatles and Brian, including a copy of the public record and other evidence of the house's provenance. They are proud of the their Epstein memorabilia collection, the largest in Europe with a number of people coming every year to see the items. The three level house offers nine guest rooms, each with its own en-suite facilities. All rooms are en-suite, have tea/coffee making facilities, and are fitted with flat screen televisions offering over 50 TV channels and 24 radio stations. Each room also has hair dryer, iron and free WiFi. There is also a newly remodelled bar perfect relaxing in the evening after a day of sightseeing. Check out their website and don't forget to mention your BBFC membership when booking to get your discount. You will need to provide your current membership number. The Beatles with an A and the BBFC are hosting Beatles Day at The Turks Head Twickenham, Sunday 19th July. You won't want to miss a single minute of this fun, family-friendly day celebrating Beatles music and fun at the famous Turks Head Pub. It was at this very pub that the the scene with Ringo playing darts in A Hard Day's Night was filmed. Prize for the best Beatles fancy dress! Time: 11AM in the morning to 10PM at night. The Cross the Scan international art project is the brainchild of two French artists known as “les Nivaux”. They have painstakingly scanned piece by piece the famous Abbey Road Zebra crossing in London. The 400 scans when joined together can fully recreate the crossing in any location. Beginning in October 2015, the giant image will be installed in famous places of the biggest cities in the world such as Paris, Roma, London, Liverpool, Berlin, Hong Kong, NY, Mexico, Montevideo, Sydney, Tokyo, and Peking. For the project to succeed, they need help. They are seeking volunteers from all around the world to help to help. If you are interested, contact them by email or on their Facebook page. The video below gives more information about the project. Retrospectacular June 20 - Your chance to sing like the Beatles! 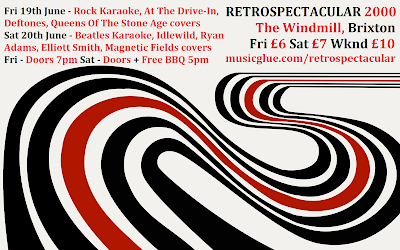 On Saturday June 20th at The Windmill, Brixton, as part of the popular "Retrospectacular" series of shows, YOU can come sing a Beatles song with a live band. The year in focus is the year 2000, which may seem incongruous to The Beatles, but as you may remember, the "Beatles 1" album, compiling all of the band's number one hits, was one of the biggest selling albums of the year, and Retrospectacular curator Dan, who for five years fronted the band 4 or 5 Magicians (named after a line from the Magical Mystery Tour film) needed no excuse to finally perform a Beatles set at one of his shows, 50 years on from the year of release of the seminal albums Help! and Rubber Soul. Tickets are just £7 and include a free BBQ meal, with veggie and non-veggie options available. Visit musicglue.com/retrospectacular to purchase an advance ticket, or simply buy on the door! Something new at the Beatles Story - Check it Out! Little Stevie Wonder’s contract to play at the Cavern Club has been loaned to the award-winning Beatles Story in the Albert Dock. The incredible artefact is dated 7 January 1966, when Stevie was aged just 16 and embarking on his amazing journey to success. Pieces of original Beatles merchandise that were sold at the Cavern Club in the early 1960’s have also been loaned to the tourist attraction by Cavern City Tours and are now on display. The Cavern Club memorabilia has been re-homed for Beatles enthusiasts to see what was on offer during the height of Beatlemania. The selection of original merchandise includes a Cavern Club pendant and leather chain, a PVC membership holder, an autograph book and a Cavern Club t-shirt. Amongst the 12 pieces of merchandise is the original price list which has been included to give visitors to the world famous attraction an understanding of the cost of items on sale over half a century ago. Another rare artefact that Cavern City Tours has loaned is one of the Beatles Yellow Submarine 33c stamps - believed to be the first American stamp produced in honour of a rock group. The stamp was launched to celebrate the rerelease of the animated film Yellow Submarine at International Beatles week in Liverpool in 1999. Dave Jones, company director of Cavern City Tours, has also loaned some NEMS (North End Music Stores) items from his own private collection. These include a typed letter to Bob Wooler on NEMS letterhead signed by Brian Epstein dated August 1963, an original 78 vinyl record sleeve with NEMS Walton Road printed on the sleeve and a red and white plastic record sleeve for albums with the addresses of the NEMS Whitechapel and Great Charlotte Street stores printed on it. 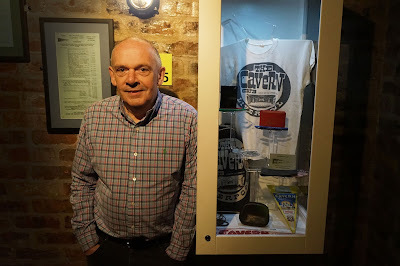 Martin King at the Beatles Story in the Albert Dock said: “The loan by Cavern City Tours and by Dave Jones is greatly appreciated by everyone here at the Beatles Story and I am sure the same can be said for the visitors of the exhibition. The Cavern memorabilia and NEMS items will be of great interest to all Beatles fans, both young and old, and the stamp is a rare piece we have not seen before so will I’m sure be a popular piece for our visitors. Dave Jones, company director of Cavern City Tours, who loaned the artefacts, said: “The Cavern Club collection of artefacts includes a considerable number of items dating from 1957 to the present day. “As part of The Cavern Club's close working relationship with our colleagues at the Beatles Story we have loaned the exhibition a number of items from the 'Cavern Collection' for display in the exhibition's recreation of the Cavern Club. All the memorabilia, including the original merchandise, the Beatles U.S postal stamp and Little Stevie Wonder’s contract is now on display in the Beatles Story exhibition’s Cavern Club section.